Walking along College Street at the border of the University of Toronto, I came to an intersection where the walking signal was a hand with the palm pointing at me. This means that I am supposed to stop as cars traveling in a perpendicular fashion have the right of way. The opposite of the palm is a profile of a person in mid-step. This means that the pedestrian has the right of way. Racing along College Street towards this particular intersection was an ambulance. When an ambulance, or any other vehicle equipped with sirens, such as a firetruck or police car, approach a red light, they are required to stop in order to ensure no other vehicles are moving through the intersection. This ambulance did just that and stopped at the red light. All cars pulled to the side of the road and pedestrians stood frozen, except for two people who started crossing the street in front of the ambulance. The ambulance started to accelerate through the intersection and abruptly stopped when they saw the pedestrians. 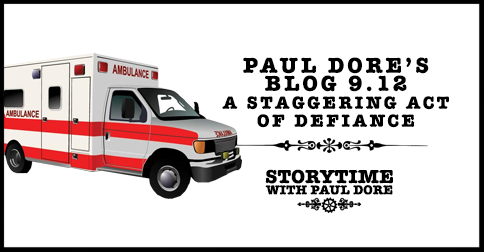 These two people, these representatives of an evolved intellectual capacity and showcasing a unique display of a very specific and individualized sense of entitlement, pointed at the symbol of a profile of the person in mid-step and angrily wagged their finger at the ambulance in a staggering act of defiance. Their finger-wagging was letting the ambulance driver know who had the right of way. And this right of way was with these pedestrians, who then crossed very slowly. In this scenario, they are the winners and the person in the back of the ambulance or the person they were racing to save are the losers.